The lively text, abundant photographs, and clear drawings of this book make pruning any plant easy. 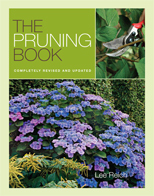 This book walks you through the basics of pruning in a clear, step-by-step approach and then details how to prune everything from ornamental bushes to trees, vines, fruits, and houseplants. Guidelines for pruning hundreds of species, from tropical to cold-climate plants, are included. A section on specialized pruning techniques covers espalier, topiary, bonsai, and pollarding. For both beginning and advanced gardeners. This second edition is completely revised and updated, incorporating my own experiences and the experiences of other gardeners, as well as recent research with pruning that has surfaced since the first edition was published in 1997. Beyond substantive changes, revised text and many new photographs should make this edition even more accessible than the first edition. "This book contains not only the whys and hows of pruning; Lee Reich`s humor, rich style of writing, beautiful pictures and clear illustrations make it a welcome addition to my gardening book collection."